In the fall our Irish Setters like to hunt in the National Forests for partridge, quail and other game bird. 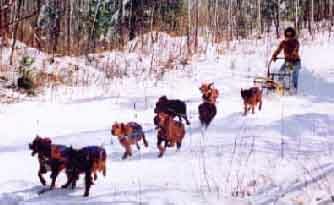 In the winter, they enjoy dog sledding through the forests and in dog mushing competitions. We enter them in dog mushing competitions just for the fun of the sport. Our Irish Setters are so people friendly they usually like to stop along the way and visit the many photographers and crowds that have come to see the dog sledding races. When our Irish Setters hear the crowds cheering near the end race they take off running full speed just to get near the people who are cheering them on and taking their pictures. 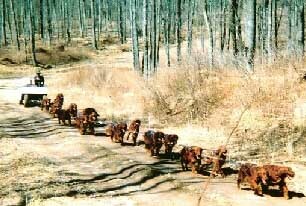 People who see our beautiful deep mahogany red dogs at the dog sled races often ask us if we have Irish Setter puppies for sale, so they can have one of these magnificent dogs for a family pet. For more pictures of our Irish Setters and their puppies view the other three pages on this site. Ireland's Maunroad Line---Off season Dog sled racing. 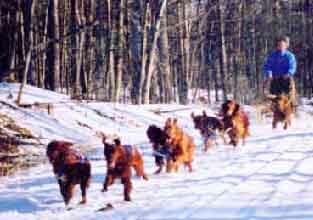 Our Irish Setter dog sledding team is off to a flying start.